When King Rama I decided to move the capital to Bangkok, he had a series of defensive canals dug to protect the eastern approach to the city (the inner-most runs down the middle of the map below), effectively turning the core of the royal city into an island, called Ratanakosin. All of the government functions were originally operated from buildings and compounds located on Ratanakosin Island. Many are ostensibly still headquartered here, although most of the day to day operations are housed in suburban locations. There has been talk of turning many of these buildings into museums, similar to the Smithsonian in Washington DC, but not much has come of that. 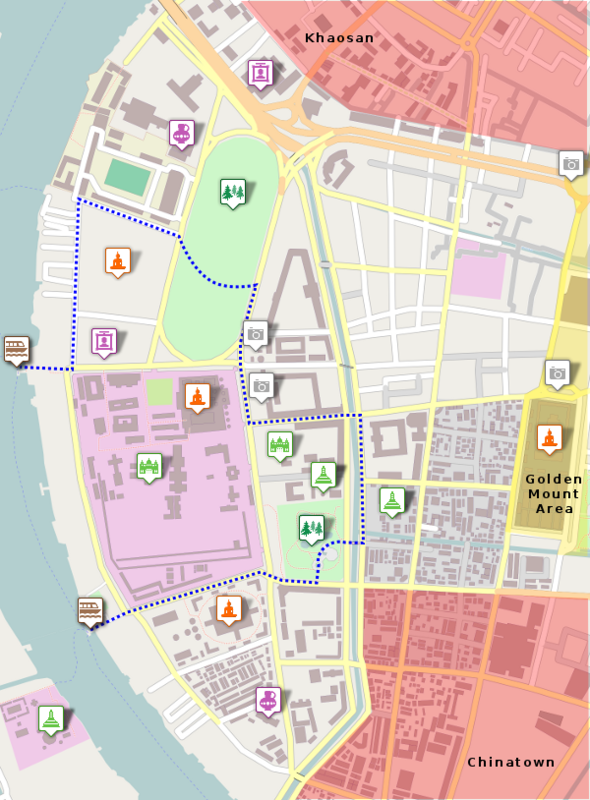 The dotted line indicates the suggested route for a walking tour. Click on any icon for more information. Most tourists will visit the Grand Palace at the center of the island, and usually Wat Po as well. However, there's a lot more of interest than just these two sights. The walking tour will take you through many of the more unique sights of the royal city. The only part of the Grand Palace open to the public is Wat Phra Keo. The Temple of the Emerald Buddha (Wat Phra Keo) is a sort of national cathedral, housing one of the country's most sacred objects. As such, entry is free to Thais but foreigners must pay an entry fee. The temple is enclosed by a cloister like gallery painted with scenes from the Ramakien, the Thai epic based on the Hindu Ramayana. The park was originally a palace. It was built by Rama IV in 1866. He planned to use it after he abdicated but he died before it was completed. Rama V gave the palace to his sons, including the crown prince, who stayed there before becoming king. The basic layout of the park today is as it was designed by Rama IV. The temple's unique design has the large wiharn and ubosot linked by a circular courtyard. In most Thai temples, the ubosot sits on its own in a square courtyard. In the center of Wat Ratchabophit's courtyard, between the ubosot and the wiharn, is a large gilded chedi containing a seated Lopburi-style Buddha image. This small crowded temple was started by Rama IV. The temple is finished mostly in small gray marble tiles laid out to form a sort of checkerboard pattern. One of the most interesting features are two prangs in the style of Angkor Thom in Cambodia. Next to the city pillar and facing the Grand Palace is the collection of canons belonging to the ministry of defense. Many a guidebook has commented on the fact that most of the guns are aimed at the grand palace. Just opposite the northeast corner of the grand palace is the city pillar, or Lak Muang. Every Thai city has one, but Bangkok's is one of the largest and most elaborate. The pillar was driven into the ground on the auspicious time and date of 6:45 a.m. on the 21st of April in 1782, the official date of Bangkok's founding. The large open space in front of the Grand Palace, in the shape of a running track, is where formal celebrations such as the annual Royal Ploughing Ceremony are held. However, most of the time its where people come in the evening for some air. Between late February and April, the grounds are also the main place to see traditional Thai kite fights. Founded in the 18th century, the temple pre-dates the founding of Bangkok, but was considerably altered after one of its monks, the young Prince Mongkut, later became King Rama IV of Thailand. Built around the sprawling former palace of the second king (sort of a crown prince), the National Museum presents an expansive view of Thai history, from prehistoric settlers to relics of the quite recent past.